A blog post has appeared from the Lab announcing that Project Sunshine – otherwise known as Server-side Appearance (or Baking as was), and a part of the Project Shining initiative – will go live across the grid this week. BlueSteel and LeTigre will have SSA enabled following the Release Candidate deployments on Wednesday August 21st (as Magnum is currently the only channel with SSA enabled). So, if you haven’t already updated to an SSA-capable viewer, you have less than 24 hours in which to do so before you start seeing a lot of avatars failing to render correctly. Currently, all maintained TPV viewers with the exception of Dolphin (V3-style) and Imprudence (V1-style) support SSA rendering of avatars. We have stats that show that it should speed up avatar loading time for everyone, so hopefully it will go smoothly and be a great improvement across the grid. As with previous blog-posts on the subject, the Lab have included a viewer of the new service and what it means. Group Tools updated on August 18th to version 2.2.20. On the 5th/6th August 2012, an aerodynamic capsule large enough to hold compact family car separated from its cruise stage “life support” system after an eight-month journey from Earth and blazed a trail across the high, thin atmosphere of Mars at the start of what those responsible for it had dubbed the “seven minutes of terror”. Inside that aeroshell was the most advanced remote science system yet sent into interplanetary space by humankind, 80 kg (around 180 pounds) of science equipment packaged neatly into a rover vehicle itself just under a tonne in weight and powered by a “nuclear battery”. If all went well, those “seven minutes of terror” would end with NASA’s latest and most ambitious mission to the planet Mars safely on the surface of that world. If things went badly, a lot of people would be looking at almost a decade of their endeavours smashed to pieces along with the rover. Of course, things did go well. The rover, dubbed “Curiosity” by an 11-year-old girl called Clara Ma following a nationwide competition held by NASA in 2008, landed safely and so wrote the first lines in what have been a remarkable year of operations on Mars. Just over half-way through its primary phase of a full Martian year (about 1.8 times longer than a year here on Earth), Curiosity and the Mars Science Laboratory mission has already achieved a major part of its mission goal: to discover if Mars demonstrates any evidence for once having the kind of environment conducive to the formation of life. 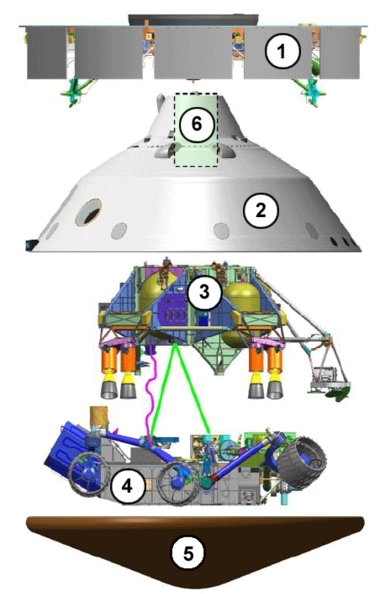 And with the mission indefinitely extended beyond that primary mission phase (the rover’s RTG power system should be able to power it for around 14 years or so, so only the unforeseen accident or failure might now curtail the mission in less than that time frame), the opportunities for Curiosity to write many more new chapters in our understanding of Mars are considerable. Over the last year, as an aside to my reporting on Second Life and virtual worlds (as well as one or two other things! ), I’ve tried to provide a steady narrative on the mission in these pages (with more than a little help from NASA JPL! ), I’ve done so as space exploration is of interest to me for assorted reasons, and because the reports seem to have resonated with some of you who regular read this blog (and thank you on both counts, for reading the blog and the reports!). Obviously, as with all things fresh and exciting, coverage of the mission in the early months was easy; such was the media interest in the story that information was flooding out of NASA’s Jet Propulsion Laboratory as the rover went through its month-long post-landing commissioning activities, and then started its first hesitant operations on the dusty, wind-swept floor of Gale Crater. With the passing of a year, media interest has moved on. As a result, the science and engineering teams responsible for the mission have been able to focus more on their day-to-day work, and the updates coming out of NASA have slowed somewhat. Curiosity is now well into the eight kilometre (five miles) drive to its next target: the lower slopes of Aeolis Mons (“Mount Sharp”), the mound surrounding the central peak of the crater. In the six weeks since departing “Glenelg” and “Yellowknife Bay”, where it had been engaged in science activities for almost six months, the rover has travelled almost a full kilometre. That the rover is making “rapid” progress is down to two things: there are no planned science objectives for this phase of the mission (unless Curiosity happens across something completely unexpected and interesting), and the rover’s drive team have gained considerable confidence in the upgraded autonomous driving capability I reported on last time around. 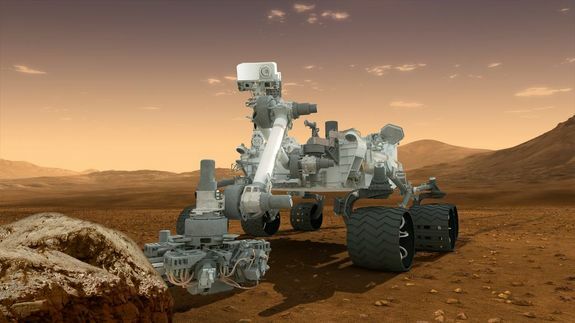 Curiosity’s primary mission is not to find direct evidence of life, past or present, on Mars, but rather to see if ancient Mars once had the right conditions present in or on it for life to have possibly arisen. Gale Crater was chosen as a landing site with this in mind; since well before the mission it has been the subject of study from orbit by the likes of NASA’s Mars Odyssey and Mars Reconnaissance Orbiter and Europe’s Mars Express. That it has surface features which appear consistent with free-flowing water once having existed on Mars have been well-known, including the fact that “Mount Sharp” itself shows signs of having been in part formed from water-borne sedimentary deposits (it is thought Gale Crater may have once been filled with a lake). As such, it was anticipated that the rover would find evidence of free-flowing water having once been present within the 194-kilometre wide crater.